Robert S. Harper described the New York World as the “recognized leader of the radical opposition to Lincoln.”1 The World was edited by Manton Marble and directed by the chairman of the Democratic National Committee, August Belmont. The newspaper was in effect the journalistic arm of the Democratic Party. Belmont biographer Irving Katz wrote: “The World had been established in 1860 by ‘several Christian gentlemen’ who desired to make available to New Yorkers a wholesome, two-cent family newspaper. In 1861 its financial condition forced a merger with another small daily, The Courier and the Enquirer, which had also been losing money. The joint enterprise failed, however, to show a profit and was placed on the block. The World‘s night editor, twenty-seven-year-old Manton Malone Marble, had considerable journalistic experience and believed he could make it a successful paper if funds to reorganize it were found.”2 Manton had worked in Boston and New York for journals like the New York Evening Post and Harper’s Magazine. 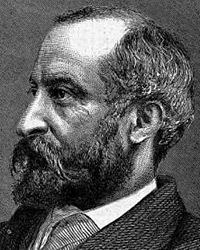 The World, however, was Marble’s chance to play in the big leagues of journalism as the manager of his own newspaper, a role which he played well until he retired from journalism in 1876. “In April, 1862, Marble got a six-month mortgage on the World‘s property, assembled an able, experienced staff, and assumed sole proprietorship. By September Marble realized he would be unable to pay off the note. A Democrat of the [August] Belmont persuasion, he also saw the need for a party voice in the press. He approached a group of prominent Democrats, including [August] Belmont, [Samuel L.M.] Barlow, and [Samuel J.] Tilden, and effected a marriage of mutual convenience by selling them shares in his newspaper. The World‘s circulation under its new auspices climbed immediately, so that it soon ranked fifth among the more than twenty metropolitan dailies,” wrote Belmont biographer Irving Katz.3 In taking up his new partners, Marble gave up managerial and editorial independence but gained political clout. In all seasons of exigency, it becomes a nation carefully to scrutinize its line of conduct, humbly to approach the Throne of Grace, and meekly to implore forgiveness, wisdom, and guidance. For reasons known only to Him, it has been decreed that this country should be the scene of unparalleled outrage, and this nation the monumental sufferer of the Nineteenth Century. With a heavy heart, but an undiminished confidence in our cause, I approach the performance of a duty rendered imperative by my sense of weakness before [the] almighty, and of justice to the people. ‘It is necessary that I should tell you that the first Virginia campaign under Lieut. Gen. Grant, in whom I have every confidence, and in whose courage and fidelity the people do well to honor, is virtually closed. He has conducted his great enterprise with discreet ability. He has crippled their strength and defeated their plans. In view, however, of the situation in Virginia, the disaster at Red River, the delay at Charleston, and the general state of the country, I, Abraham Lincoln, do hereby recommend that Thursday, the 26th day of May, A.D., 1864, be solemnly set apart throughout these United States as a day of fasting humiliation and prayer. President Lincoln’s reconsideration of that portion of the order which called for arrest of the editors probably was taken upon the advice of Dix, who had the case in hand from the start. The early arrest he promised may have been accomplished a few hours after the forgery appeared, although it was not until two days later that the New York Tribune heard a suspect was in Fort Lafayette. On Saturday morning, May 21, the Tribune said it ‘understood’ that Joseph Howard ‘one of the editors’ of the Brooklyn Daily Eagle, had been arrested. Historian George Milton Fort wrote: “Stanton was furious over the blunder, charged that the papers were deliberately inciting treason and insurrection, and demanded of Lincoln that they be suppressed at once. The War Secretary prepared an executive Order, directing the commanding general of the Military Department of the East to stop their publication The President and the Secretary of State signed it, and Major General John A. Dix ‘reluctantly executed’ it. Soldiers occupied the two printing establishments for three days.”21 There was also an order to arrest Manton and the editor of the Journal of Commerce. Manton found several other outlets for his anger. He sought legal redress through Governor Horatio Seymour but the cautious Seymour declined to act until after President Lincoln had lifted the newspapers’ suppression. And when a grand jury was impanelled to investigate, it declined to take any action against General Dix. In the autumn of 1862 I chanced to be associated with Mr. Lincoln in a transaction which, though innocent and commonplace in itself, was blown by rumor and surmise into a revolting and deplorable scandal. A conjectural life, although mean, misshapen, and very small at its birth, grew at length into a tempest of defamation, whose last echoes were not heard until its noble victim had yielded his life to a form of assassination only a trifle more deadly. Mr. Lincoln was painted as the prime mover in a scene of fiendish levity more atrocious than the world had ever witnessed since human nature was shamed and degraded by the capers of Nero and Commodus. I refer to what is known as the Antietam song-singing; and I propose to show that the popular construction put upon that incident was wholly destitute of truth. The newspapers and the stump-speakers went on ‘stuffing the ears of men with false reports’ until the fall of 1864, when I showed Mr. Lincoln a letter, of which the following is a copy. It is far sample of hundreds of letters received by me about that time, the Antietam incident being then discussed with increased virulence and new accessions of false coloring. To pimps and pets may crack his stories,’ etc. I wish to ask you, sir, in behalf of others as well as myself, whether any such occurrence took place; or if it did not take place, please to state who that ‘other officer’ was, if there was any such, in the ambulance in which the President ‘was driving over the field [of Antietam] whilst details of men were engaged in the task of burying the dead.’ You will confer a great favor by an immediate reply. Along with the above I submitted to Mr. Lincoln my own draft of what I conceived to be a suitable reply. The brutal directness and falsity of the ‘World‘s’ charge, and the still more brutal and insulting character of the doggerel with which it was garnished, impelled me to season my reply to Mr. Perkin’s letter with a large infusion of ‘vinegar and gall.’ After carefully reading both letters, Mr. Lincoln shook his head. ‘No, Lamon,’ said he, ‘I would not publish this reply; it is too belligerent in tone for so grave a matter. There is a heap of cussedness’ mixed up with your usual amiability, and you are at times too fond of a fight. If you were, I would simply state the facts as they were. I would give the statement as you have here, without the pepper and salt. Let me try my hand at it.’ He then took up a pen and wrote the following. It was to be copied by me and forwarded to Mr. Perkins as my refutation of the slander. The President has known me intimately for nearly twenty years, and has often heard me sing little ditties. The battle of Antietam was fought on the 17th day of September, 1862. On the first day of October, just two weeks after the battle, the President, with some others including myself, started from Washington to visit the Army, reaching Harper’s Ferry at noon of that day. In a short while General McClellan came from his headquarters near the battle-ground, joined the President, and with him reviewed the troops at Bolivar Heights that afternoon, and at night returned to his headquarters, leaving the President at Harper’s Ferry. On the morning of the second the President, with General Sumner, reviewed the troops respectively at Loudon Heights and Maryland Heights, and at about noon started to General McClellan’s headquarters, reaching there only in time to see every little before night. On the morning of the third all started on a review of the third corps and the cavalry, in the vicinity of the Antietam battle-ground. After getting through with General McClellan he and the President left their horses to be led, and went into an ambulance or ambulances to go to General Fitz John Porter’s corps, which was two or three miles distant. I am not sure whether the President and General McClellan were in the same ambulance, or in different ones; but myself and some others were in the same with the President. On the way, and on no part of the battleground, and on what suggestions I do not remember, the President asked me to sing the little sad song that follows, which he had often heard me sing, and had always seemed to like very much. I sang it. After it was over, some one of the party (I do not think it was the President) asked me to sing something else; and I sang two or three little comic things, of which ‘Picayune Butler’ was one. Porter’s corps was reached and reviewed; then the battle-ground was passed over, and the most noted parts examined; then, in succession, the cavalry and Franklin’s corps were reviewed, and the President and party returned to General McClellan’s headquarters at the end of a very hard, hot, and dusty day’s work. Next day, the 4th, the President and General McClellan visited such of the wounded as still remained in the vicinity, including the now lamented General [Israel B.] Richardson; then proceeded to and examined the South-Mountain battleground, at which point they parted,—General McClellan returning to his camp, and the President returning to Washington, seeing, on the way, General [George L. Hartsuff], who lay wounded at Frederick. This is the whole story of the singing and its surroundings. Neither General McClellan nor any one else made any objections to the singing; the place was not on the battlefield; the time was sixteen days after the battle; no dead body was seen during the whole time the President was absent from Washington, nor even a grave that had not been rained on since it was made. This perfectly truthful statement was written by Mr. Lincoln about the 12th of September, 1864, less than two years after the occurrence of the events therein described. It was done slowly, and with great deliberation and care. The statement, however, was never made public. Mr. Lincoln said to me: ‘You know, Hill, that this is the truth and the whole truth about that affair; but I dislike to appear as an apologist for an act of my own which I know was right. Keep this paper, and we will see about it.’ The momentous and all-engrossing events of the war caused the Antietam episode to be forgotten by the President for a time; the statement was not given to the press, but has remained in my possession until this day. Mark how simple the explanation is! Mr. Lincoln did not ask me to sing ‘Picayune Butler.’ No song was sung on the battlefield. The singing occurred on the way from Burnside’s corps to Fitz John Porter’s corps, some distance from the battle-ground, and sixteen days after the battle. Moreover, Mr. Lincoln had said to me, ‘Lamon, sing one of your little sad songs,’—and thereby hangs a tale which is well worth the telling, as it illustrates a striking phase of Mr. Lincoln’s character which has never been fully revealed. Who played with us upon the green, some twenty years ago. Your sweetheart’s just beneath it, Tom; and you did mine the same. Just as she died whose name you cut, some twenty years ago. Upon the graves of those we loved, some twenty years ago. Mary Cortona Phelan, Manton Marble of the New York World, p. 31. Robert S. Harper, Lincoln and the Press, p. 291. Frank Abial Flower, Edwin McMasters Stanton, p. 212-213. Ernest A. McKay, New York in the Civil War, p. 248. Augustus Maverick, Henry J. Raymond and the New York Press for Thirty Years, p. 320. Roy P. Basler, editor, The Collected Works of Abraham Lincoln, Volume VII, p. 347-349. Robert S. Harper, Lincoln and the Press, p. 292. Mary Cortona Phelan, Manton Marble of the New York World, p. 32-33. Robert S. Harper, Lincoln and the Press, p. 295. Allan Nevins, The War for the Union, The Organized War to Victory, 1864-1865, p. 68. Allan Nevins, The War for the Union, The Organized War to Victory, 1864-1865, p. 69. Abraham Lincoln Papers at the Library of Congress. Transcribed and Annotated by the Lincoln Studies Center, Knox College. Galesburg, Illinois. (Letter from Sydney H. Gay et al. to Abraham Lincoln1, May 19, 1864). Robert S. Harper, Lincoln and the Press, p. 294. Roy P. Basler, editor, The Collected Works of Abraham Lincoln, Volume VII, p. 347-348 (May 18, 1864). George Milton Fort, Abraham Lincoln and the Fifth Column, p. 221. David M. Black, The King of Fifth Avenue, p. 243. Robert S. Harper, Lincoln and the Press, p. 299-300 (The World, May 23, 1864). Robert S. Harper, Lincoln and the Press, p. 300 (The World, May 23, 1864). Mary Cortona Phelan, Manton Marble of the New York World, p. 36-37. Allan Nevins, editor, Diary of the Civil War, 1860-1865: George Templeton Strong, p. 451 (May 23, 1864). Stephen W. Sears, editor, The Civil War Papers of George B. McClellan: Selected Correspondence, 1860-1865, p. 599 (Letter from Manton M. Marble to George B. McClellan, September 12, 1864). Stephen W. Sears, editor, The Civil War Papers of George B. McClellan: Selected Correspondence, 1860-1865, p. 599 (Letter from George B. McClellan to Manton M. Marble, September 17, 1864). Irving Katz, August Belmont: A Political Biography, p. 136. Allan Nevins, The War for the Union: The Organized War to Victory, 1864-1865, p. 112. Sidney David Brummer, Political History of New York State During the Period of the Civil War, p. 421 (New York World, September 12, 1864). Jean H. Baker, Mary Todd Lincoln: A Biography, p. 203 (New York World, September 22, 1864). Robert S. Harper, Lincoln and the Press, p. 307. Ward Hill Lamon, Recollections of Abraham Lincoln, p. 144-148. John Waugh, Reelecting Lincoln, p. 318-319. Allan Nevins, The War for the Union: The Organized War to Victory, 1864-1865, p. 100-101. Stephen W. Sears, editor, The Civil War Papers of George B. McClellan: Selected Correspondence, 1860-1865, p. 624 (Letter from George B. McClellan to Manton M. Marble, November 28, 1864). Herbert Mitgang, editor, Lincoln as They Saw Him, p. 455. Robert S. Harper, Lincoln and the Press, p. 289. Irving Katz, August Belmont: A Political Biography, p. 116-117. Mary Cortona Phelan, Manton Marble of the New York World, p. 24-25. Irving Katz, August Belmont: A Political Biography, p. 118. Edwin G. Burrows and Mike Wallace, Gotham: A History of New York City to 1898, p. 886.